I love gardening in raised beds. In fact I’d argue that everything about gardening in raised beds is easier than growing in the ground. Well, everything except for the part where you make them. The ability to customize the soil. 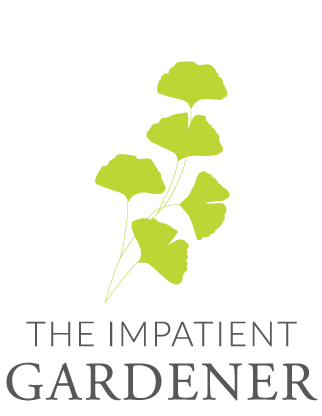 A defined garden area that’s easier to maintain. 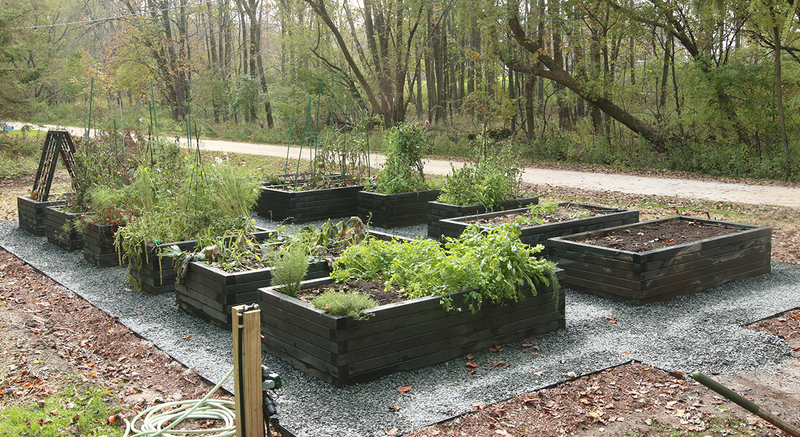 This raised bed vegetable garden was admirably orderly but every bit of space was used. 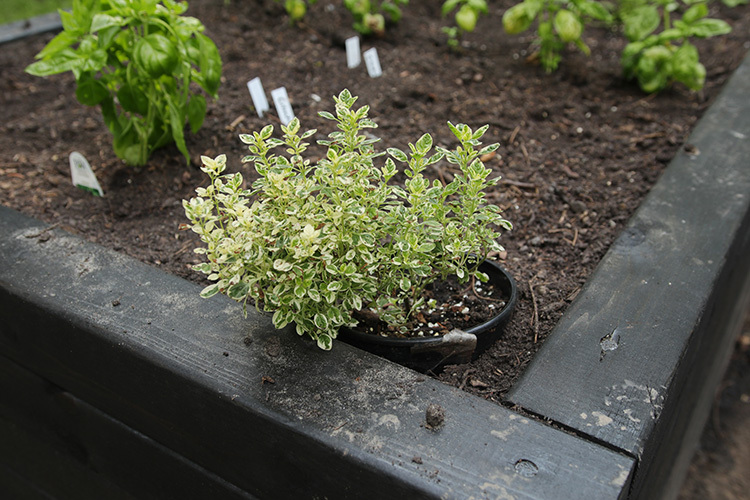 You can get very creative designing a raised bed, but if you don’t feel like thinking outside the box (pun intended) there are oodles of pre-made raised bed gardens on the market. If plain old wood doesn’t float your gardening boat, consider animal stock tanks, a kiddie pool or really any other big container. The only requirements are that if you use something with a bottom you must put a lot of holes (bigger is better) in the bottom for drainage and that you choose something that is non-toxic. You can decide for yourself how you feel about plastic, most of which is technically safe, but avoid something like tires. Cedar or redwood. Pros: Long-lasting, naturally rot resistant. Con: Expensive. Untreated pine. Pros: Inexpensive, easy to find. Con: Can rot quickly. Treated pine. Pros: Long-lasting, less expensive than cedar or redwood. Con: Although many people suggest it is safe for growing food, some gardeners may not be comfortable with using it. You can line the sides of beds with a thick plastic to help protect the wood, but that may have other environmental concerns to consider. 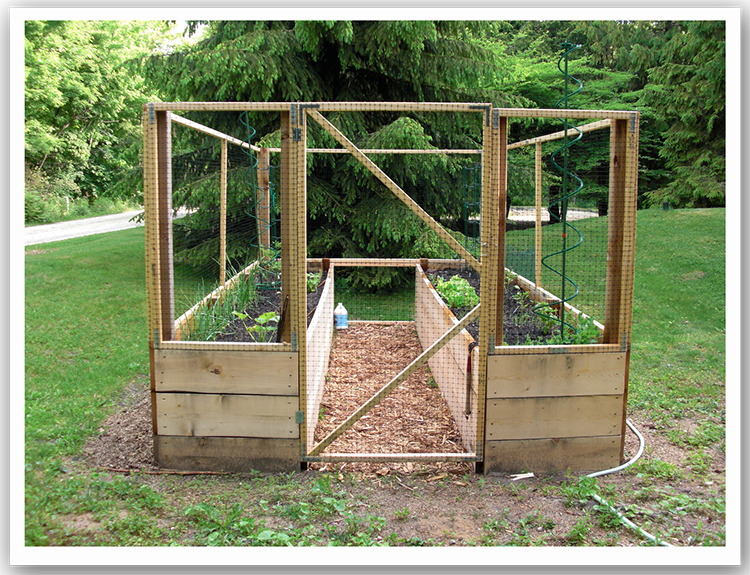 When we build our first raised bed garden we used cedar posts and 2-by-10 untreated pine boards. It lasted for about nine years until the boards at the bottom were quite rotten. Interestingly, when we took it apart, the cedar posts were even more rotten than some of the pine. Keep in mind though, that this is southeastern Wisconsin where presumably wood lasts longer than it might the south. 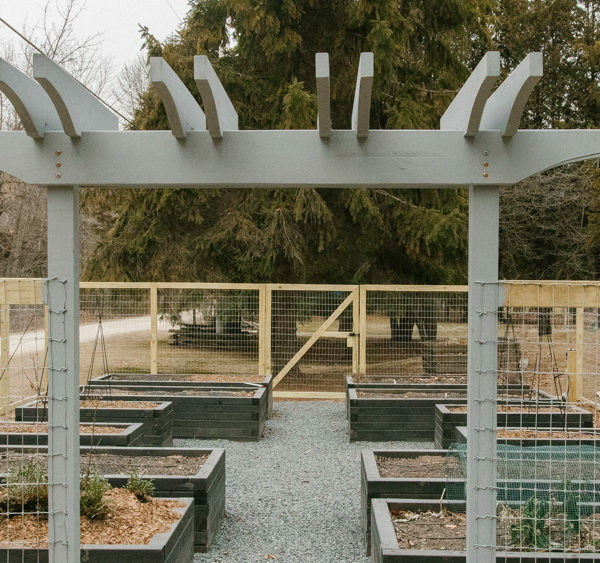 The first raised bed garden we made had cedar posts, untreated pine boards and built-in deer fencing. 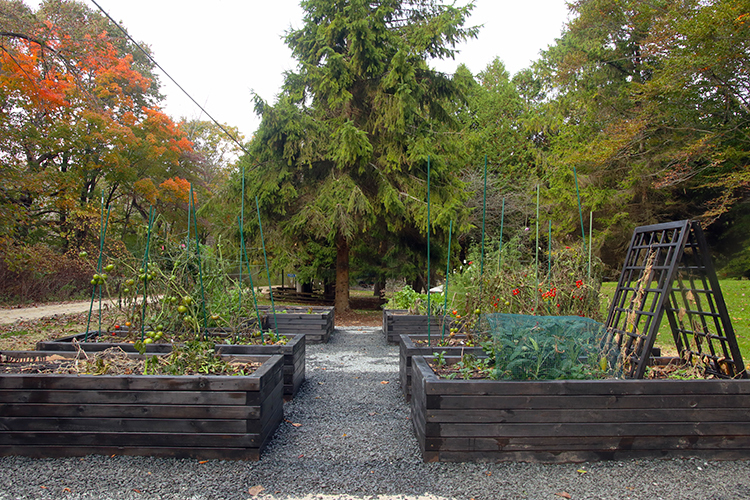 We built our new raised beds, we used 4-by-4s, with cedar for the bottom course and untreated pine for the rest. We then used a nontoxic wood stabilizer to coat the insides to help protect the wood. You can read about the construction process here and the wood stabilizer we used here. A note on size: You can make your raised bed any size or shape you like, but make sure you can reach the middle of it without stepping in the bed. Four feet wide is about the maximum width. If you have particularly long or tall beds, add athwartship support to keep the beds from splaying. You may also want to consider stapling hardwire cloth (metal mesh with half-inch holes) on the bottom of your beds to keep burrowing critters from getting in. 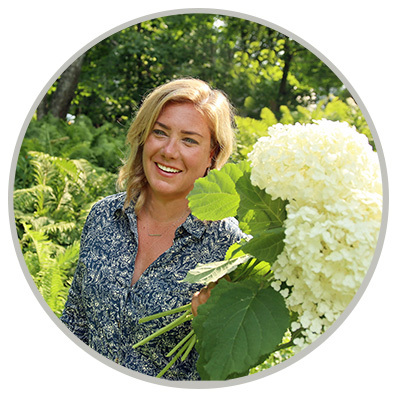 One of the great benefits to raised beds is that you can customize the soil in a way you just can’t when you’re working with the native soil in your yard. But what kind of soil should you use? Generally speaking, it should probably be some combination of screened topsoil, compost and other organic material like leaf mold, worm castings and well-rotted manure. Joe Lamp’l shared his soil recipe here. When it came to filling our new raised beds, I bought a pre-mixed “raised bed mix” from a local independent garden center. It wasn’t cheap, but if there’s one place to spend money when creating a raised bed garden, it’s on the soil. Personally, I think you’ll find nicer soil if you buy in bulk, but if you have just one small raised bed you can also buy it in bags. If you have deep beds, you don’t have to fill them entirely with soil. You can fill the bottom of the bed with any organic material like branches, leaves or tree trimmings. But you need to remember that this material will compress and break down over time and you’ll have to top off the soil every year to keep the bed full. That’s why I opted not to do this in the new vegetable garden because in the old garden it became a hassle to have to put so much new soil in every year. I hate gardening rules, but I’m going to offer one here: Never, ever step foot in your raised beds. The soil in raised beds is exceptionally productive and can have great structure, but you’ll ruin that if you compact it by stepping in them. Just don’t do it. The new raised bed vegetable garden before the fence was installed. Usually you can plant closer in raised beds than you might in an in-ground garden because the soil is dialed in and fertile. Take advantage of every square inch by doing succession planting and using fast-growing crops to fill in while something else is maturing. 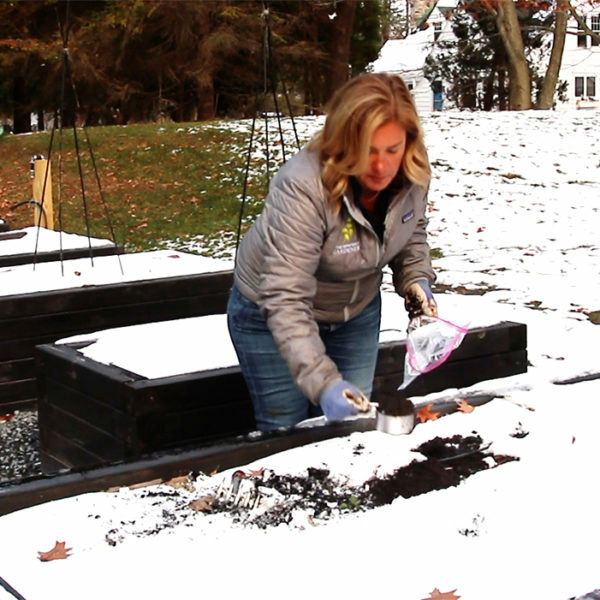 Think about ways to use your beds all year long, even in cold climates. It’s easy to construct mini hoop houses over them to extend the season. I heel perennials and shrubs still in containers at the end of the season into my raised beds to overwinter them. 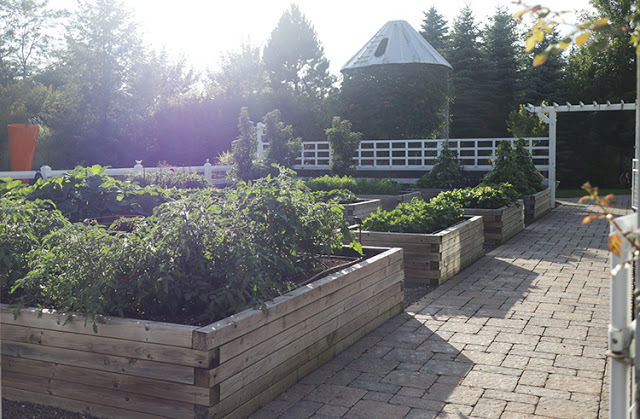 And one more item that’s not a rule, but a suggestion: Even if you create a raised bed to grow food, consider adding a few flowers to help attract pollinators and spruce the joint up a little. previous post: Can we just talk about faux plants? I was offered a set of polypropylene planting bags by a Home Depot promotion. I filled them with organic potting soil from Costco. I had wonderful production of vegetables and flowers last year. The bags are supposed to last several seasons. They do need watered a bit more than plants in the ground. We have the bags in a fenced area–so no deer. I saw on our security cameras that we had a ground hog wander through the garden and it did not try to get into the bags. It seemed to me that we did have fewer bugs in the garden too. However, we had so many tiny frogs last year, perhaps they were eating the bugs. Your raised bed garden is much prettier. However, we are old gardeners, and this was a perfect answer for raised beds for us. 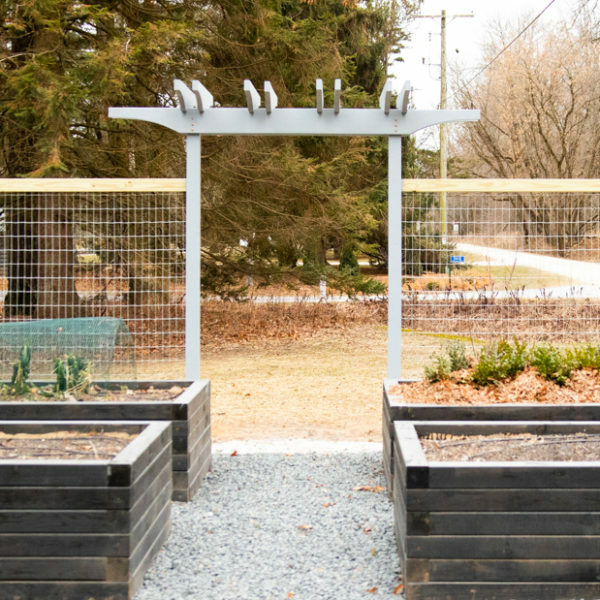 I think the next time I have to rebuild my veggie garden I’m going to get those metal horse troughs and just lay them on a bed of gravel. My beds were repaired last season, but the snow pack and frost heaves really do a job on them! I have 20 bags of compost on order to refresh the soil this spring, though, and the seeds are already started under grow lights. Bring on the spring! I love raised beds! One of the best parts is the allowance for high-density planting.